As a company specialising in high performance polyurethane coverings, LUC has been supplying roller coaster wheels both to OEM’s and theme parks for many years. 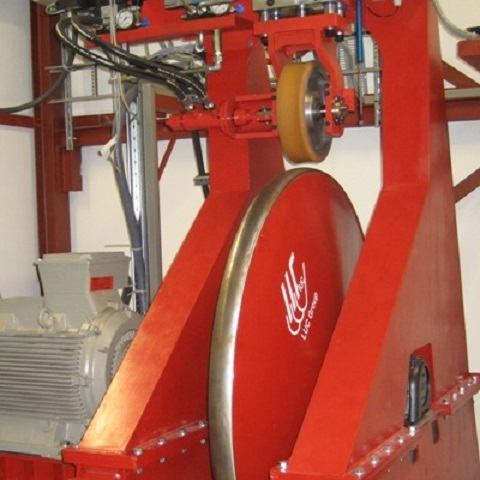 In 2008 LUC decided to invest in the development and build of a new class of wheel testing equipment, having the ability of the complete simulation of an actual roller coaster ride, including real time variation of load and speed. With this new testing equipment speeds up to 320 km/h and loads up to 70 kN per wheel are possible. After 2 years of design, engineering and building, the new Ride Simulator came into operation in 2010. LUC’s engineers carried out numerous tests and development work on the equipment, in many cases in close cooperation with the customer. Create new possibilities by developing new or improved materials, suitable for higher speeds and/or loads. Facilitate development of new rides, with the ability to test wheels for a roller coaster before the ride is built. Reduce risks by being able to test individual wheels on a certain specification and supply these wheels with a test certificate. Reduce testing costs for making improvements on an existing ride. If you would like to receive more information regarding this Ride Simulator or more in general, please feel free to contact us.